Named after 'Pietra di Botticino', the beautifully veined Italian marble that has been used extensively throughout our hotel, Trident, Bandra Kurla, Botticino restaurant is an ode to hearty Italian flavours. 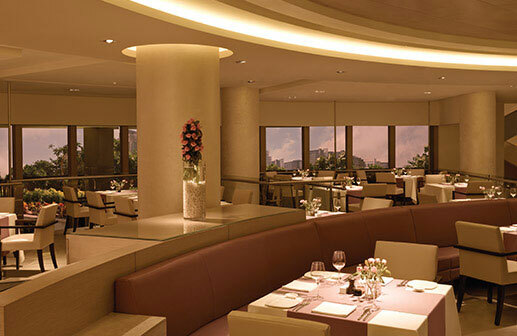 The menu presents a wide range of classic Italian dishes, served with a contemporary flair. The ambience of the restaurant is one of contemporary and refined simplicity with an extensive use of beige botticino Italian marble, gentle cove lighting and furnishings in pastel shades of lavender and cream - offering a perfect setting for fine dining. Lunch – 12 p.m. to 3.00 p.m.
Dinner - 7 p.m. to 11 p.m. The new Presto lunches at Botticino feature a variety of authentic Italian dishes served with an eye on the clock, to save your time. Choose any 3 courses from a selection of wholesome soups, crunchy salads, scrumptious main courses and light desserts. The delicious Butternut Squash Tortellini - The flavors in this dish touches all the taste buds on one’s tongue; sweet from the butternut squash, umami from parmesan fondue, meaty and earthy taste from morel, and tangy and sourness from candied orange which will end like a musical note on your palate. A definite must try! The grappa display in Botticino comprises a fine range of grappas in some of the most beautifully designed Venetian glass bottles from Grappa Alexander by Distilleria Bottega in Italy.